I have C1 9.3 and i cant import RAW from Canon d80, can someone try to import it? I uploaded it on wetransfer. What happens when you try to import it? Nothing, empty library. When there are some jpegs and raws from d80, only jpegs go to c1 library. I try it on 3 computers (one windows 7, two windows 10), i have no problems with RAW from Nikon d750, Canon 5d MkII and MKIII. Can somebody try that RAW fram my link on C1? 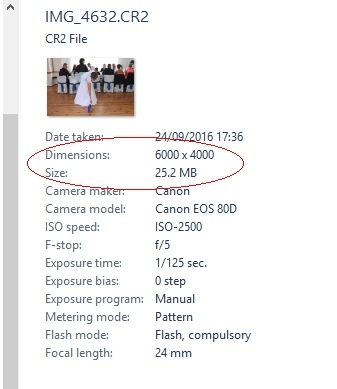 Are these Canon 80D files RAW or mRAW? 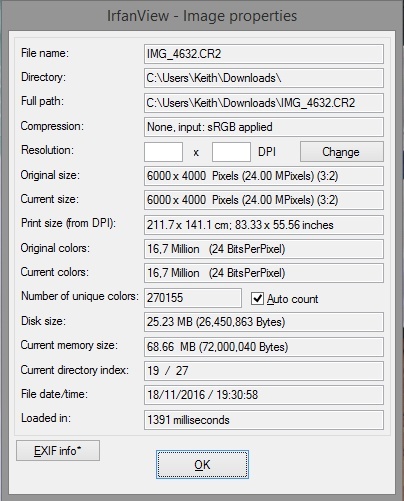 The file I downloaded was c.25mb Bob, according to Windows Explorer and Irfanview, yet any rate - and it's the right size (6000 x 4000 px) as a full Raw 80D file. That said - it is behaving like an mRaw, and it throws up the same message in Photo Ninja that mRaws (which PN doesn't support at all) generate. Last edited by Keith Reeder on Sun Nov 20, 2016 11:20 am, edited 1 time in total. NN634699141794327784UL wrote: I have C1 9.3 and i cant import RAW from Canon d80, can someone try to import it? It's mRAW, not full RAW. According to 9.3 release notes, mRAW is not supported. Edit/PS: full RAW imports fine on Mac, but this file doesn't. Any idea why that should be? It seems that Irfanview and Windows explorer only look for this information. But why is that info - especially the file size - there at all, in an mRaw? Anyway, yes, this is an unsupported file. Thanks for help. I opened it in Canon Digital Photo Professional 4 and it is mRAW. So problem is solved. I uploaded all kind of RAWS from canon 80d, if someone want to try it. Last edited by NN634699141794327784UL on Mon Nov 21, 2016 7:25 pm, edited 1 time in total. I've got the downloaded IMG_4632.CR2 file open, right here in front of me. It is 3000x4500px. 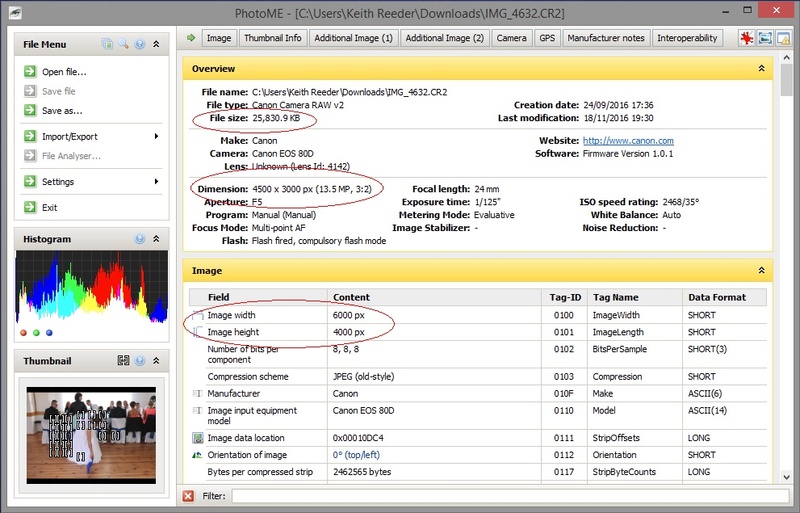 (Using Adobe's DNG Converter v9.7 and PS.) So it either is mRAW or something really strange is going on. Yep, it is an mRaw, Hans - but the weird size reporting has me scratching my head.